Living in the ‘information age’ means we have access to a vast amount of information on so many topics. If we want to know anything about any subject we all head straight for Google and usually find out the answer within seconds. However, there’s nothing like a book to really properly explore a topic and I’ve found two great books about women’s cycling that you might find useful. The first one I actually read in Kindle format on my newly acquired Ipad in January this year but the second one is a fully fledged printed book that I picked up on sale at my local bike shop. This book by American Selene Yeager is a great beginner’s guide to cycling for women. Sadly for me, when I read it, I’d already worked out much of the information myself but it still helped to reinforce. It would have been great to discover this book about three years ago when I was a newbie rider trying to grasp some of the finer points of cycling. Yeager covers basics like find the right bike, gearing up and how to start training. It’s very easy to read and comprehend and deals with issues that are specific to women, although much of the information covered applies equally to men. One area I found curious in the chapter devoted to training plans was the focus on weight loss. I know that many women are focused (probably a bit too much) on weight loss but for me weight has never been a goal for cycling. It’s just a nice side benefit if it happens. However, she does also cover training plans for riding a century. This is an American book so her century is a 100 mile ride which in our terms is 160 km. For me this plan came just a little bit too late. I actually completed a 160 km ride during the time I was reading the book. She also covers training for a 40 km time trial. Racing is also covered and she encourages anyone who likes a challenge to give it a go. The basics are covered like the different types of races, what you need to know before you race. Both road and off-road racing are included. The final chapter is about making time to ride and how you can make cycling a priority in your life. This is particularly specific to women who have so many competing activities in their lives. 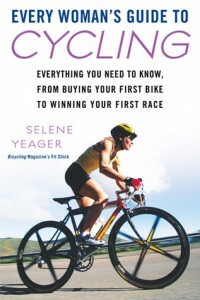 Selene Yeager also writes a regular blog for Bicycling magazine in the US which you can find here. I must admit that I haven’t read this entire book, just dipped in here and there. It is a very female focused book which is great. She covers topics that are often quite taboo and certainly rarely discussed like menstrual cycles, cycling while pregnant and issues affecting older women like menopause. Like Yeager, Gale Bernhardt is an American so the measurements are all in imperial rather than metric so keep a conversion tool or app on hand so you can convert miles in kilometres and inches into centimetres. Bernhardt uses research to dispel the myth that women have shorter torsos than men. In fact she says that the real issue is that women have shorter arms and hands than men so therefore it is more important to have a shorter stem and easier gear lever reach. Interesting stuff. Her detailed chapter on bike fit applies equally to men and women and is worth a read if this is a problem for you. The chapters on training were particularly appealing to me. Bernhardt says there are a number of common mistakes that many cyclists make including: riding the same speed all the time; having no goals and no plan; and, having a sloppy nutrition and hydration routine. I’m certainly guilty of at least the first and third of these mistakes and I know I need to re-read the information in the book on these subjects if I’m serious about making any real improvements. Bernhardt also advocates strength training as an adjunct to your cycling program and covers a number of exercises you can do with just a simple weight set. The all important step of setting goals, eating correctly and preparing yourself mentally is also covered as well as comfort and safety in the concluding chapter. I would recommend both books very highly. The first one for beginners who want some great tips to get started and the second one for women who want to take their cycling up a level. Happy reading. Previous Post:How do I get my wife/partner to ride with me? FYI. 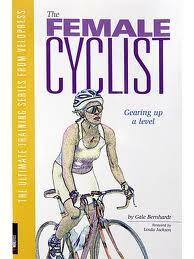 Gale Bernhardt told me via Twitter that there’s an updated edition of her book – The Female Cyclist.